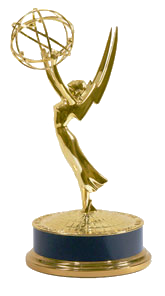 The Daytime Emmy Awards Show took place last night at the Beverly Hilton in California, where all of the soaps remaining on the air happen to be filmed. I am going to guess that most of the other programs honored are also based in LA, but that's just a guess. I have no knowledge of where they produce things like Trisha's Southern Kitchen and Dr. Oz. Or, for that matter, Morning Express, Showbiz Tonight or Good Morning America, which furnished this year's hosts for the Emmy show. I have a hard time believing that something called Showbiz Tonight is actually broadcast during the daytime, but it doesn't matter. Let's just say hosts Sam Champion, A.J. Hammer and Robin Meade, who apparently hail from the aforementioned shows, were completely unknown to me, as well as terrible hosts, and leave it at that. In any event, the Daytime Emmys are much less of a soap opera event than a chat show/kids show/cooking show event now, mostly because there are only four daytime dramas left. The Bold and the Beautiful, Days of Our Lives, General Hospital and The Young and the Restless are it for network TV, although All My Children and One Life to Live have resurfaced on Hulu, and One Life to Live's last episodes on ABC were apparently recent enough to garner nominations for editing, writing and for the show itself. And wouldn't it have been funny if a show that hasn't been on ABC since January 13, 2012 had won all three of those awards? In an upset, Days of Our Lives took Best Drama, while The Bold and the Beautiful swept the directing and writing awards, as well taking home Best Actress for Heather Tom and sharing half of the Best Supporting Actor award, where B&B's Scott Clifton tied with Billy Miller of The Young and the Restless. Doug Davidson, also of The Young and the Restless, won Best Actor, and Julie Berman, who left General Hospital in February of this year, won Best Supporting Actress for her GH role as Lulu Spencer. Kristen Alderson, who moved her character of Starr Manning over from One Life to Live to GH when the former show was canceled, won Best Younger Actress for playing Starr on GH, even though the internet reprise of One Life means she isn't allowed to play Starr anymore for legal reasons involving who owns the characters that originated in One Life's Llanview. Got that? The Younger Actor award is a bit less complicated. Chandler Massey won that one for his role as Will Horton on Days of Our Lives, which he has played since 2009. Massey took the same award last year. In other areas, CBS Sunday Morning was named Best Morning Show, Best Thing I Ever Made and Tricia's Southern Kitchen tied in the Culinary category, and Dr. Oz, The Ellen DeGeneres Show and The Price Is Right picked up awards as Best Talk Show (Informative), Best Talk Show (Entertainment) and Best Game Show. Host awards went to Ricki Lake, whose talk show was canceled after one season, Ben Bailey of Cash Cab, and chef Lidia Bastianich, whose name was massively mispronounced by "Skinnygirl" presenter Bethenny Frankel. Yeah, she was definitely skinny. The highlights of the evening included Corbin Bernsen swearing up a storm as he did an impression of his late mother, Jeanne Cooper, who was part of this year's In Memoriam reel; everybody else expressing their awe at the presence of George Lucas, who won an Emmy for the animated show Star Wars: The Clone Wars on the Cartoon Network; and Julie Marie Berman's obvious shock at winning Best Supporting Actress for a role she is no longer playing. Otherwise... Good heavens, those hosts were terrible. Or maybe it was just all the technical miscues that were not their fault. But I have to think some of the soap stars, talk show or game show hosts hanging around would've rolled with the punches much better. I can't imagine Alex Trebek or Wayne Brady having that sort of trouble. Or, you know, Ellen DeGeneres. I'm still not sure I understand that legal point about Starr. You were perfectly clear, I have no doubt, but it's so convoluted I'll have to read it a couple more times. It does tickle me that the Cash Cab guy won. I only see that show when I'm in the barber chair, and I wouldn't have thought of him as a "host" exactly. But he's fun.